Rohtak: Army columns conducted flag marches at various places in violence-hit districts of Haryana on Saturday as security forces grappled with the tense situation in areas where the Jat agitation demanding reservations had turned violent. Sources said that hundreds of Jat protesters continued their siege of some parts of Rohtak town on Saturday afternoon and were not willing to disperse despite warnings by the local authorities. 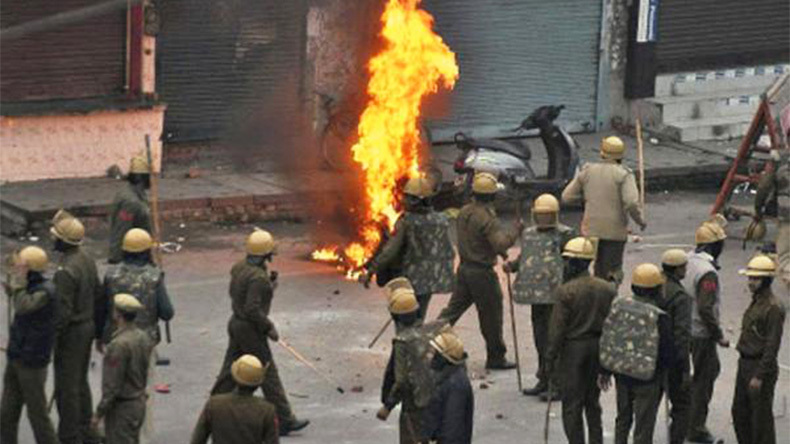 Curfew continued in Rohtak and Bhiwani towns on Saturday. Reports of violence, torching of vehicles, and damaging government and railway property also came in on Saturday. Despite the army being deployed, the situation in Haryana continued to remain tense. Soldiers were air-dropped earlier on Saturday in violence-hit Rohtak town after the protesters blocked and dug up roads to prevent the entry of the military. The agitation began as Jats are demanding reservation for the community in government jobs and educational institutions. Looting and arson continued in the town through Friday night with unruly mobs targeting malls, shops and other buildings and many of them were set on fire. Indian Air Force helicopters conducted several sorties to transport soldiers into some parts of Rohtak town. “Around 20-30 troops were being brought into Rohtak town by choppers. They will be deployed in areas which are under siege of the Jat protesters,” a senior officer told IANS. Authorities in Rohtak asked people not to venture out of their houses as the army prepared for a flag march. The army also staged a flag-march in Bhiwani town. Officials said that the situation was under control. Reports said that National Highway No. 1 (NH-1) was blocked by protesters in Sonipat district, 50 km from Delhi. The Delhi-Ambala railway track remained blocked since Friday evening. Hundreds of passengers were stranded as railway authorities cancelled several trains on the route. Nearly 550 trains were either cancelled or diverted since the agitation began a week ago. On Friday, the agitation that started a week ago, got even worse and resulted in the death of three people and dozens, including security personnel, were injured. The mob also attacked the office of the Rohtak range inspector general of police (IGP) and set the house of Finance Minister Abhimanyu on fire. Jat leader Hawa Singh Sangwan said that the youth have taken over the agitation. Authorities have also blocked internet and SMS services in the affected districts. Haryana DGP Y.P. Singhal arrived in Rohtak town by helicopter to take stock of the situation. He admitted that enough police deployment was not there when the agitation started earlier this week. Is National Thowheeth Jama'ath linked with Sri Lanka bomb blasts?